If you’re a college graduate, you likely went to school to pursue an important passion of yours. But as we all know, what we major in has consequences that extend far beyond the foundation of knowledge we build in our early years. As Visual Capitalist's Jeff Desjardins notes, any program we choose to enroll in also sets up a track to meet future friends, career opportunities, and connections. Even further, the college degree you choose will partially dictate your future earning potential – especially in the first decade after school. If jobs in your field are in high demand, it can even set you up for long-term financial success, enabling you to pay off costly student loans and build up savings potential. Today’s chart comes to us from Reddit user /r/SportsAnalyticsGuy, and it’s based on PayScale’s year-long survey of 1.2 million users that graduated only with a bachelor degree in the United States. You can access the full set of data here. 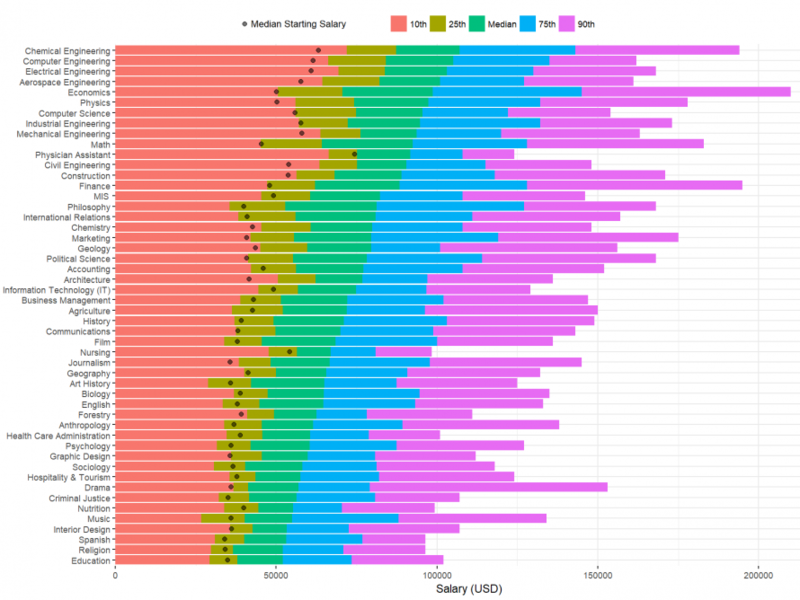 Starting median salary: The median of what people were earning after they graduated with their degree. In other words, the starting median salary represents what people started making after they graduated, and the rest of the chart depicts the range that people were making 10 years after they got their degree. Lower earners (10th percentile) are the lower bound, and higher earners (90th) are the upper bound. What college majors win out? Based on this data, there are a few interesting things to point out. The top earning specialization out of college is for Physician Assistants, with a median starting salary of $74,300. The downside of this degree is that earning potential levels out quickly, only showing a 23.4% increase in earning power 10 years in. In contrast, the biggest increases in earning power go to Math, Philosophy, Economics, Marketing, Physics, Political Science, and International Relations majors. All these degrees see a 90% or higher increase from median starting salary to median mid-career salary. 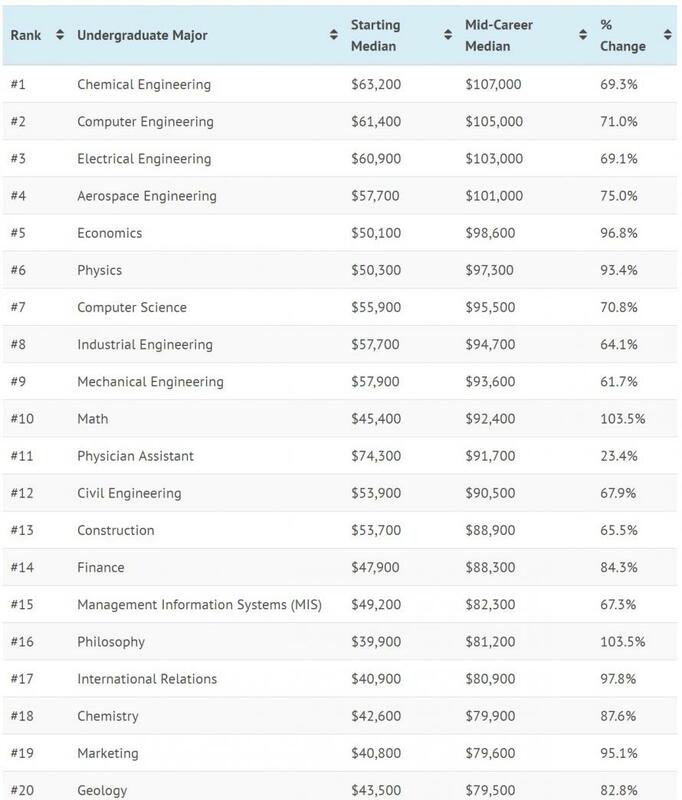 In absolute terms, the majors that saw the highest median mid-career salaries were all along the engineering spectrum: chemical engineering, computer engineering, electrical engineering, and aerospace engineering all came in above $100,000. They also generally had very high starting salaries. As a final note, it’s important to recognize that this data does not necessarily correlate to today’s degrees or job market. The data set is based on people that graduated at least a decade ago – and therefore, it does not necessarily represent what grads may experience as they are starting their careers today.